About 3 weeks ago on a warm Saturday we decided to go for a ride in the late afternoon and stop at a restaurant for tea. Mary for some reason said "Ït doesn't matter if we go a bit later, we have got lights to come home in the dark". Well that jinxed it. We came out of the restaurant, started the bike ...and no lights !! We managed to get home by me holding my thumb on the headlamp flasher all the way. Fortunately the park lamp position still worked so we had a taillamp. The switch and the connected relay had both failed. New items were obtained from the UK in 6 days and then came the task of fitting it. 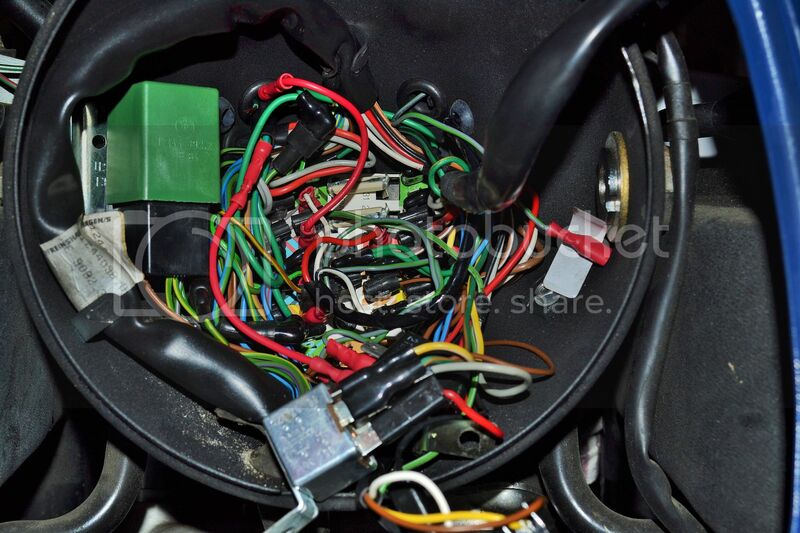 BMW wiring is complicated, but very logical it's just that it is all crammed into the headlamp shell. This is what one I was confronted with. It didn't help that I had added a couple of accessories and had only used one colour of cable. I initially had a problem getting the indicator buzzer to work. It is wired so that it doesn't sound in neutral or when the clutch is disengaged. This is to make it silent when you are waiting at an intersection. This is an item from an earlier model which they stopped installing in production as owners didn't like them. I personally think it's a great idea as I have witnessed on several ocassions a motor cyclist nearly have a bad accident due to not cancelling the indicator because he/she was distracted by other traffic at a critical moment. However, after getting it all back together I discovered the neutral light was coming on when I disengaged the clutch. After a bit more investigation I deduced that there was a diode in the circuit which I had probably destroyed while trying to get my buzzer correctly connected. I was firstly perplexed by the thought of having to disconnect all the wires in the headlamp and remove the connection board (hardly visible in the picture as it is obscured by the colourful spaghetti) as the diode is on the back of this. A bit more internet research told me that now I had a diode which was letting current flow both ways, it could just stay there and a new diode could be installed elsewhere in the circuit. This turned out to be a simple, but fiddly fix and all appears to be working as it should, though I haven't ridden it on the road yet. I am hoping to put that right today.